A new Italian catalogue records the results of recent excavations at the ancient Faliscan sanctuary of Monte Li Santi-Le Rote at Narce, which is located 9km south of the ancient settlement of Falerii (modern Civita Castellana). The assemblage of votives from this sanctuary is completely unique, and the publication, entitled I Tempi del Rito [Times of Ritual], will be of great interest to academics working on material religion. The book’s co-editor, Dr Jacopo Tabolli, has kindly allowed us to reproduce here the English summary of the site which appears in the front of the catalogue, along with some photos of votives excavated from the sanctuary. 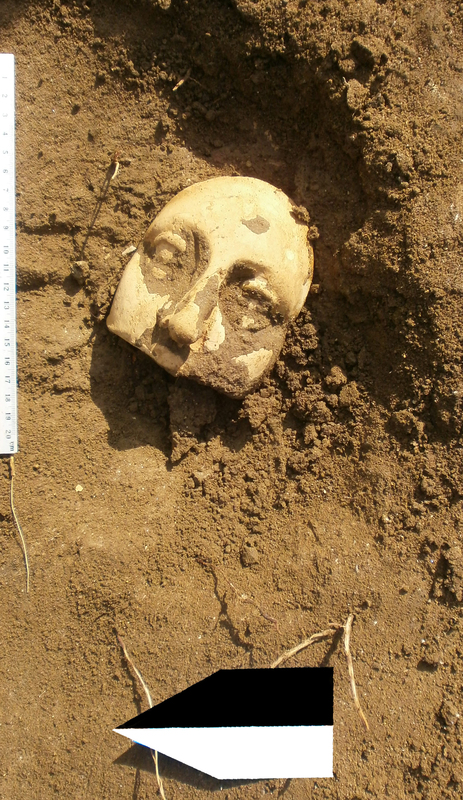 Perhaps the most striking finds are the clay ‘masks’ of male and female faces, and the group of more than 100 iron keys, which, as Dr De Lucia Brolli and Dr Tabolli explain below, may have symbolised the ritual closure of the sanctuary around the turn of the second and first centuries BC. The catalogue I Tempi del Rito is edited by Maria Anna De Lucia Brolli and Jacopo Tabolli, and published by Officina Edizione. You can examine the Narce material at two museums in the local area: the Museo Archeologico dell’Agro Falisco at the Forte Sangallo in Civita Castellana (ancient Falerii), and the Museo Archeologico-Virtuale of Narce at Mazzano Romano (MAVNA). The discovery of the sanctuary of Monte Li Santi-Le Rote at Narce, the southern town of the Ager Faliscus, dates back to 1985. Annual excavations were carried out until 2004 by the Soprintendenza per I Beni Archeologici dell’Etruria meridionale. A recent excavation in October 2014 was promoted in order to investigate the area where new pillars of the renovated roof will be placed. The exhibition is developed into two different museums: the Museo Archeologico dell’Agro Falisco, in Civita Castellana and the Museo Archeologico-Virtuale di Narce, in Mazzano Romano. In the Museo Archeologico dell’Agro Falisco, the different ritual contexts of foundation and sacrifice, as well as the rituals associated with new-born infants, are on display. All the artefacts come from the excavation of the sanctuary between 1985 and 2004. 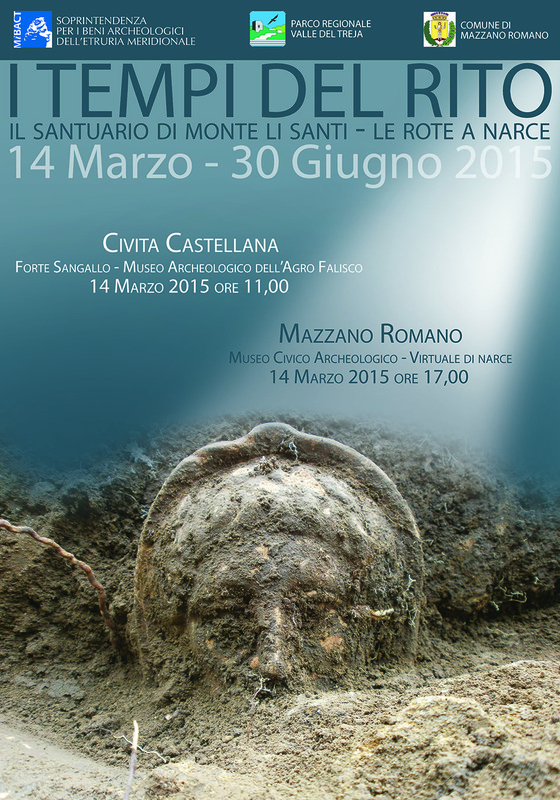 At the Museo Civico Archeologico-Virtuale di Narce, the results of the 2014 excavation are on display, from the foundation of the Sacellum of the 5th century to the ceremony for the final abandonment of the sanctuary at the end of the 2nd century BC. The sacred area of the sanctuary of Monte Li Santi-Le Rote is located in the territory of the municipality of Mazzano Romano and sits in a valley on the eastern bank of the Treja River, on the foothills of Monte Li Santi, which was one of the parts of the ancient town. The sanctuary was oriented NW-SE and contained several different sacred buildings and enclosures along different terraces, gradually sloping towards the river. From the 6th to the 2nd century BC, a continuity of cults is attested in the sanctuary, which goes on also after the Roman conquest. The excavations revealed six major phases in the life of the sanctuary, consisting of different reconstructions and transformations of the area. Phase I consists of few evidence of small walls. Recent excavations have demonstrated that these walls followed a regular pattern in their orientation, already since the 6th century BC. The earliest material belonging to this period is for the first time on display in the exhibition. The construction of a monumental temple, with elegant terracotta slabs, in the first half of the 5th century BC corresponds to Phase II. Nevertheless, this large building was rapidly abandoned. Phase III dates to 450-425 BC. Just west of the previous temple and at a lower elevation, a new sacellum (AA) was built along the Treja River. The plan of this building recalls similar sacred structures devoted to Demeter, both in Etruria and in Sicily: a decentralized access, the presence of an internal altar, the lack of a system for the decoration for the roof, which was covered only by tiles, and a small portico facing the south. Phase IV, between the mid and the end of the 4th century BC, corresponds to the period of the beginning of the Romanisation. Probably as an effect of the Roman conquest of Veii in 396 BC, Narce suffered a period of intense decline. The Sacellum AA was divided into three closed spaces (A, B, C). In this period the cults are still focused on Demeter and her daughter Persephone, the wife of Hades, as suggested by the deposition upside down of pottery, the sacrifice of newborn piglets, roosters and small birds, and by peculiar ex voto, such as the iron keys, both functional and symbolic, which were deposed during communal rituals. At the beginning of the 3rd century BC, Faliscans and Etruscans suffered a great military defeat and at that moment the three spaces A, B, and C were abandoned. This corresponds to Phase V and it is the time when the area of the Sacellum AA was completely transformed. The area was converted into an open area enclosure. Similar transformations occurred in other sanctuaries related to Demeter. The foundation of this enclosure is accompanied by the deposition of more than 300 masks. Made of different clays, varying in dimensions and features, and in many cases painted in red and white, these masks are on display in the exhibition and present individual characteristics. In this open area enclosure, people continued to deposit offerings until the end of the 2nd and the early 1st centuries BC, while major transformations occurred in the southern area of the sanctuary. The landscape of the sanctuary was slowly transformed by the presence of new open area altars. In the second half of the 3rd century BC a new cult is attested in the so-called area D, which was sacred to Minerva Maia and Fortuna. These two deities (as suggested by the inscriptions found on two blocks discovered in the area which are on display in the exhibition) continue to fulfil the role of protectors of the family, as in the previous cult. At the same time, the different spheres of influence of the deities attested by Demeter, Minerva Maia, and Fortuna, are largely comparable with regard to marriage and the protection of children. The abandonment of the existing cults in favour of the latter deity appears as a peculiar change of ownership of the sanctuary. At the same time, the core of the cult, as witnessed by the medical votives, is still focused on women as the centre for the protection of the family and of all stages of their growth. Between the end of the 2nd and the early 1st century BC (Phase VI) the entire sanctuary of Narce was abandoned. The abandonment was not sudden, but it followed a long and communal ceremony, which was based on the sacrifice and the ritual consumption of meat. 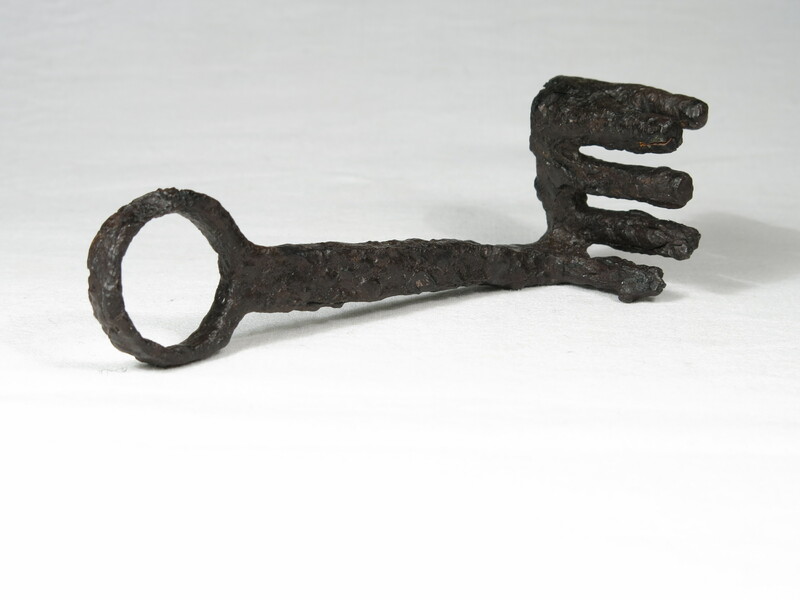 The recent excavation revealed a deep pit near the north west corner of the enclosure A, where a long iron obelos was placed together with multiple iron keys and other spits. A small terracotta statuette was broken during the ritual and deposited in the pit. On top of this deposition, more than one hundred keys were placed during the ceremony of the final abandonment of the sanctuary.